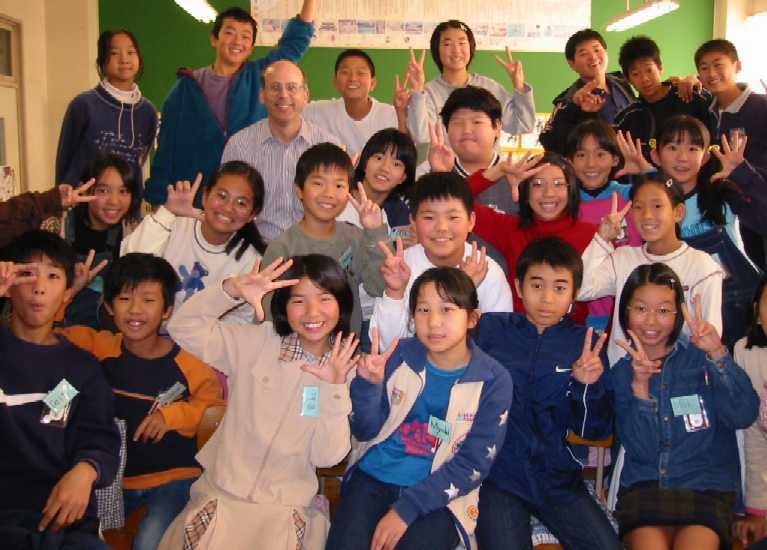 The visit to Meirin Elementary School in Nagoya was the only one of 13 visits with no connection to the Friendship Dolls. The English classes for the fifth and sixth grades at the school are taught by Ms. Yuka Onoda, who was one of my interpreters when I first went to Japan in 1986 on a business trip with no knowledge of the Japanese language. I visited three English classes, one for the fifth grade and two for the sixth grade. Since it was Thanksgiving Day in America, I talked some about the history of the holiday and what Americans typically do on Thanksgiving. Although these were English classes, I found out quickly that the amount of English I could use was quite limited. Almost all of the Japanese elementary schools I visited had some introduction to English, but the number of hours is very few. 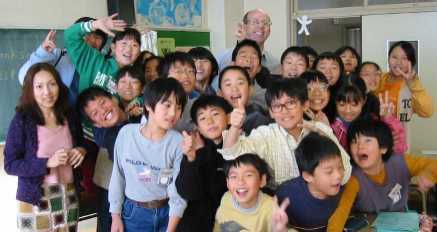 For example, at Meirin Elementary School the students received only one class period of English instruction every two weeks. The students, especially those who study English in private lessons, knew many individual words, but almost all students had great difficulty putting together full sentences and engaging in a conversation. They, of course, knew these words in Japanese, and many of the students seemed to remember that they had heard the above English words once I said them. After lunch with one of the sixth-grade classes, I was surprised when one of the girls came up and asked me three or four questions in English. Although I had some trouble understanding her because she spoke so softly, she spoke more on her own initiative than any other elementary school student I met in Japan during my school visits. I asked her if she studied English in private lessons, but she indicated that she did not. I encouraged to keep studying English since she could speak so well. At the end of the day, the sixth-grade students presented me with a "necklace" made from colored yarn. Also, one of the women at the school gave me a beautiful set of ten hina dolls made from origami paper. As I was leaving the school, I saw some first-grade students running down the hall bent over cleaning the floor with a small cloth. They showed lots of energy as they went back and forth. I wondered whether a broom, brush, or mop might not be a little bit easier. 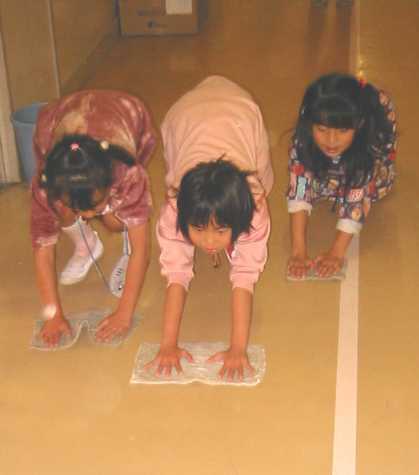 In contrast to American schools where janitors usually clean the building, the students in Japan are responsible for the cleaning of the building. Cleaning time usually occurs right after lunch before any club activities.